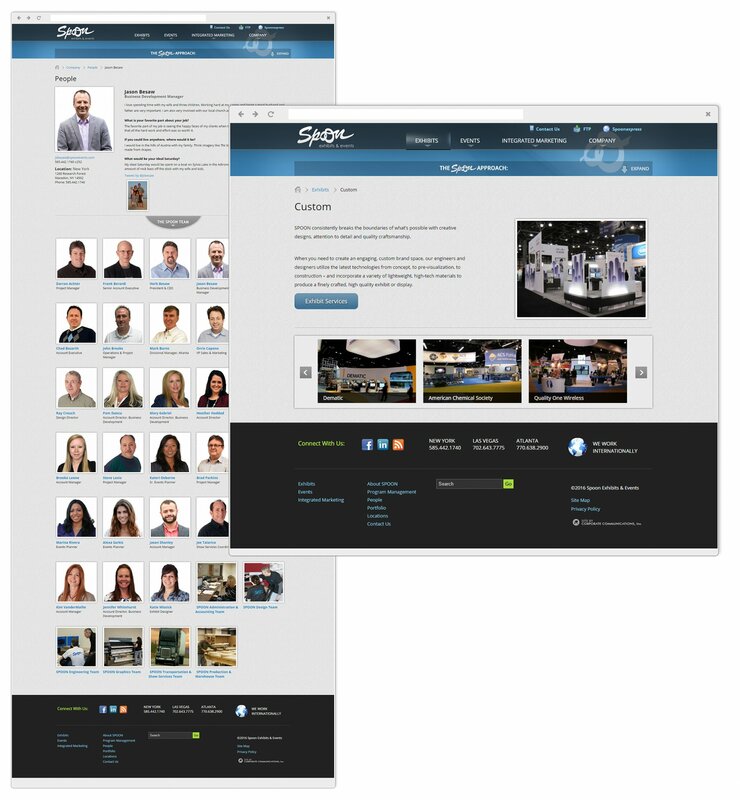 Over the past decade, Spoon Exhibits & Events has built a solid reputation as a leading full-service exhibit and event marketing company developing clientele from around the globe. With so much emphasis focused on creative event marketing and custom exhibit creation for their clients, it was becoming quickly apparent that their own brand and image needed 'a refresh'. Part of the reason for developing a new website was to unveil a new, progressive logo for the organization. The overall look and feel of the website was heavily influenced by this new logo the company was excited to begin using. The new, fresh-faced banner with client-controlled dynamic images and variable text elements brings this distinct logo and updated styling together. The organization operates within a unique 5-step approach to integrated marketing. This theme can be found throughout the site and access to the information can be reached on most pages using a creative drop-down slide panel. Achieving this goal was really one of the most exciting elements of the new website. We developed a 'bow to stern' approach to bring the people of Spoon into the spotlight. Firstly, we featured key team members on the homepage associated with interactive banners related to their specific occupation. Secondly, we linked these photos with their individual bio pages found in the People section of the website. Each show-to-site logistics specialist can update their bio ensuring clients get to know and sync with the people behind the company. One of the unique challenges to this website was the aggressive development timeline and time of year. The website redesign project was started and completed within an eight week window. Additionally, development during the holiday season with vacations and holidays made the challenge all the greater. 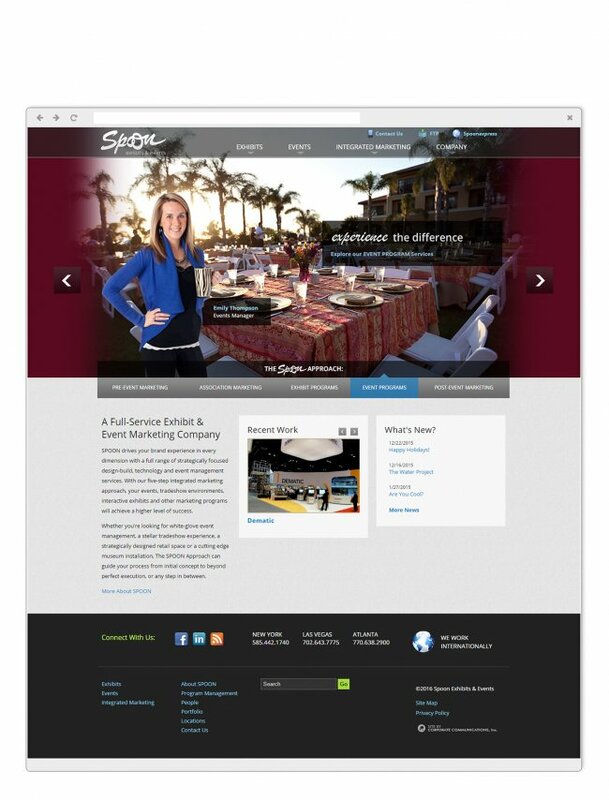 Working with Spoon Exhibits & Events, we were able to maintain close contact throughout the project and launch a great looking website the client can maintain themselves and more importantly use as a powerful marketing device.